In 2010, financial history was made when someone bought a pizza. If you haven’t heard about this groundbreaking event, don’t worry, you're not the only one. The pizza wasn’t the important part of the transaction - it was what was used to pay for it. The meal cost 10,000 bitcoins and was the first time the virtual currency was used to buy something in the real world. The day is now celebrated every year by bitcoin enthusiasts as Bitcoin Pizza Day. Things have come a long way since then. Bitcoin’s use and value have soared. If that diner had held onto those 10,000 bitcoins they may not have made history, but they would be around $20 million better off today. In March this year, the price of one bitcoin climbed above the price of one ounce of gold for the first time. But let’s take a step back. What is bitcoin? It’s a cryptocurrency, which means it exists only in the digital world. It was developed in 2009 by someone – we still don’t know who for sure – using the name Satoshi Nakamoto and is based on a payment system that allows one person to pay another, without the need for any middle parties, such as banks. A person holds their bitcoins in a bitcoin wallet - in a mobile app or computer - and can send and receive bitcoins through it. They get the bitcoins in the first place by accepting them for a good or service, or from an exchange, where they swap real money for bitcoins at the prevailing exchange rate. Every bitcoin user has their own address - a bit like a bank account number - and controls all the bitcoins coming in and out of that address. 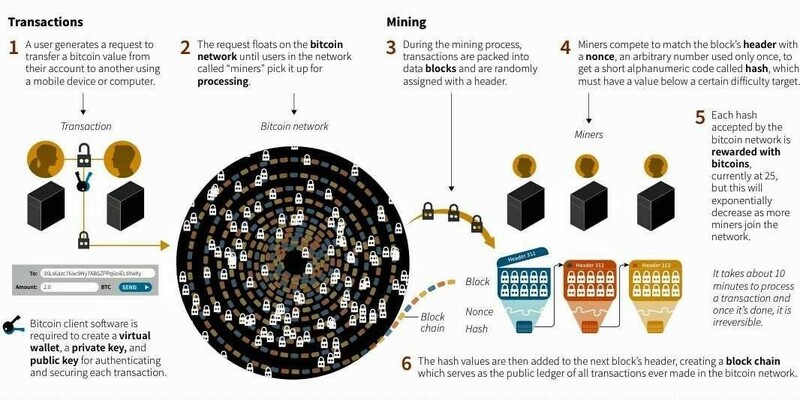 The bitcoin transactions run on a system called blockchain. This is a public ledger, which holds a record of every single transaction. The other person receives the bitcoins once the transaction is verified. This verification involves solving a complicated mathematical problem, a process called “mining”, and anyone with a powerful enough computer system can do it. What do I do with my bitcoins? You can spend them, either on the internet at places such as WordPress and Reddit, or at establishments that accept the currency. When you want to turn your bitcoins into real money, you trade them on an exchange. Whilst you’re unlikely to be able to use them at your local grocer yet, some say it is only a matter of time. There is now a Bitcoin Visa Debit card which makes spending them easier. You don’t have to understand the process of bitcoin in order to start using it, after all, few understand the inner workings of a bank. But not everything is rosy in the bitcoin world. There is a limit to how many transactions can be processed in a given time-frame, and the increase in transactions has meant a slowing down of payments. For years, those involved in bitcoin’s software development have argued over how to overcome its capacity problems. That problem is still not solved. And, like any software based system, it’s also vulnerable to attack. Then there is the matter of how different countries treat the currency. Some treat it as a commodity, like oil or gold, but others treat it like money. Some prohibit its use entirely. Governments don’t like the fact that bitcoin users are anonymous, and they have concerns over its use for criminal activity and money laundering. Their worries aren’t unfounded. In the recent ransomware attack, WannaCry hackers demanded bitcoins as payment, and so far $80,000 has been paid out. The EU wants to be able to identify bitcoin users in the name of preventing money laundering and terrorist financing. In addition, the whole system is not highly regulated. Partly, this is because any developer in the world can verify exactly how bitcoin works. The bitcoin protocol itself cannot be modified without the cooperation of nearly all its users, who choose what software they use. Even where regulation exists it is not always clear. Some say that the uncertainty over regulations will get in the way of bitcoin growing. Bitcoin is not the only cryptocurrency, lots of others have entered the market - over 200 of them. Whilst bitcoin is still the leader, Ethereum, Ripple and NEM and many others also exist. The Economist thinks that we’re in a cryptocurrency bubble from where the only way is down. Even some of those who work intimately with bitcoin say it is going to be a failure. But according to a website that tracks bitcoin “obituaries”, the currency has already “died” - ie been predicted to fail - 106 times. And a newly published study says that bitcoin and other cryptocurrencies are no passing fad. In short - no one really knows just yet.